I was listening to a BBC podcast the other day; Sophie Lake from VINE (Values In Nature and the Environment http://www.vineproject.org.uk/) was talking about her theory of ‘generational amnesia’, whereby each generation “re-calibrates” environmental diversity according to their own childhood experiences. It really resonated with me, the way it does when your own private musings are put forward publicly by someone else. I have been thinking exactly this; that each generation learns the natural world as it is when they are children, and this becomes the benchmark by which they measure change. I remember when we first came here in 1978. Giant green tree frogs were constant visitors; every evening we could hear the ‘plop’ as they landed wetly on the deck, they were so placid, you could pick them up and they would nestle comfortably in the palm of your hand, quite filling it up. And their smaller relatives, about 2 -3 cms long, which loved to sit on the windows in the most elegant frog shapes, catching the insects drawn to the light. There would be at least half a dozen of those at any one time. Now the only green tree frogs left around here are the tiny ones that hide in the trees; the only time you are aware of them is when they call just before it rains. 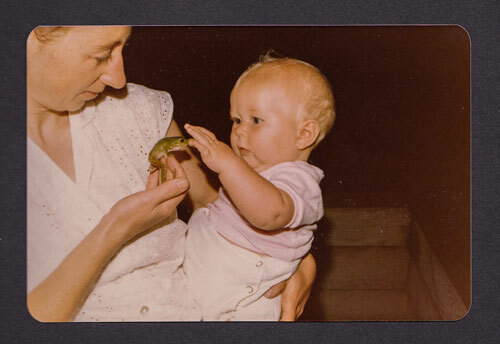 The giant tree frogs disappeared when our children were quite small; there is a photo below of one being introduced to our 18mnth old first child, but to the now adult children their absence is ‘normal’. Similarly – where have all the butterflies gone? – the brilliant black and white and red swallowtail butterflies, and the blue triangle butterflies, and a myriad complex patterned moths; a long-necked swamp tortoise is rare now when it used to be not uncommon. Generation by generation our countryside is depleted, and as a society we are scarcely aware of it. People shift their feet uncomfortably if you mention it even casually. They don’t want to be reminded.